The felony arrests the department listed on a weekly report were on suspicion of inflicting corporal injury on a spouse; possession of a stolen vehicle and carrying a concealed dirk or dagger; threatening crime with the intent to terrorize; DUI causing injury and hit and run; and a felony warrant from another agency. 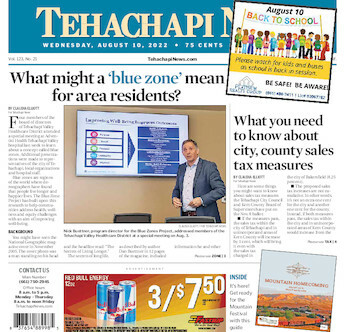 A total of 271 incidents were handled by Tehachapi Police officers, including 173 calls for service from the public and 98 officer-initiated incidents. Officers wrote a total of 39 reports. Other stats that show the work officers performed for the week: They handled 12 business or building checks and 15 checks on vehicles or pedestrians.